Bing's layout: improved results for search marketers? Here are some interesting findings from American user experience consultancy User Centric, who have been conducting a bit of research into the ways in which people look at search engines. 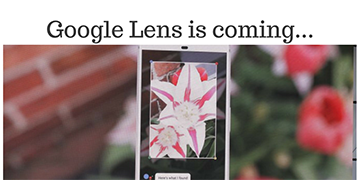 The company compared two providers – Google, and Microsoft’s relaunched Bing (whose leapfrogging of Yahoo into second place in the search market was, reports Techcrunch, short-lived) – to see how each captured the visual interest of visitors. 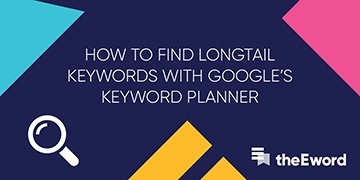 The results showed that the two search engines were fairly evenly matched when it came to the attention paid to natural search listings, with users spending an average of seven seconds looking at that area of the page. Similarly, interest in the sponsored results above the natural listings was high on both search engines. Over 90 per cent of participants spent time looking at the paid results on Google and Bing, with the duration of interest increasing on task-based (eg. ‘find a new car’) searches. Differences emerged when it came to the paid adverts that appear on the right hand side of both search providers’ results pages. Bing’s layout was found to be more effective in drawing attention to the sponsored listings, with 42 per cent of users looking at them, compared to 25 per cent for Google. These images show user activity on Bing (left) and Google. Red areas were those that were looked at for more than 4.5 seconds. The colouring on Bing's sponsored listings show they attracted more interest than Google's. Reasons cited for the difference include the space between natural and paid listings being much smaller on Bing, making users more likely to glance across to the sponsored links. Also, Bing’s ‘book-ended’ page design (which has related searches shown on the left) means surfers spend a more even amount of time looking at each section of the page. Already, some sources are suggesting that this difference may attract advertisers to Bing, as it means their ads are more likely to be viewed. However, the User Centric study showed that click-through rates were about the same on both search engines, so while more people may be looking at Bing’s sponsored links, they aren’t necessarily following them. 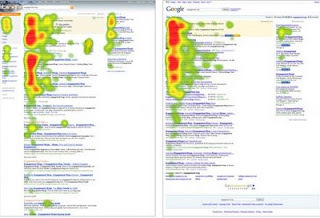 For the study, researchers used heatmaps and eye-tracking technology to monitor where on the pages users were looking. theEword employs heatmaps as part of its A/B testing process, using them to track visitor activity across different page designs. One useful aspect of the technology is that it allows designers to see which elements on the page are attracting clicks, even if those elements are inactive (leading to development questions such as ‘if that static graphic is drawing a lot of attention, would there be any gain in making it clickable, or replacing it with a sales button?’). This enables SEO teams to identify which parts of the page will be instrumental in the conversion process and make use of them accordingly.